Located in the Aamco Plaza, an automotive center just below the Metrolink tracks, Mica’s is one of a handful of restaurants that seem designed to feed you while you wait for your car to be serviced. The narrow Mica’s storefront has been home to a revolving door of eateries, seemingly having a new occupant each time you drive past. Mica’s opened in March 2013, an eternity by that space’s standards, and the only reason it should leave is if it finds a better space. In other words, you might want to take your food to go. I braved dining in both times. Reader Andy introduced me to Mica’s. 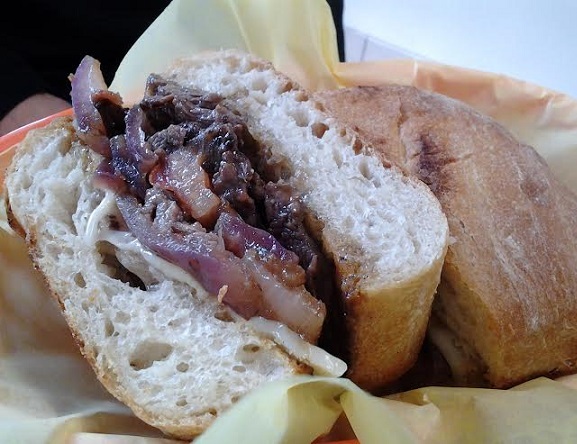 We had lunch: He got lomo saltado in sandwich form (below), I got a chicharron sandwich ($5.79 each). Mine was pork, onions and sweet potato on focaccia bread. Wow! The display case, by the way, has Peruvian cookies, empanadas, canned Inca sodas and mousse. 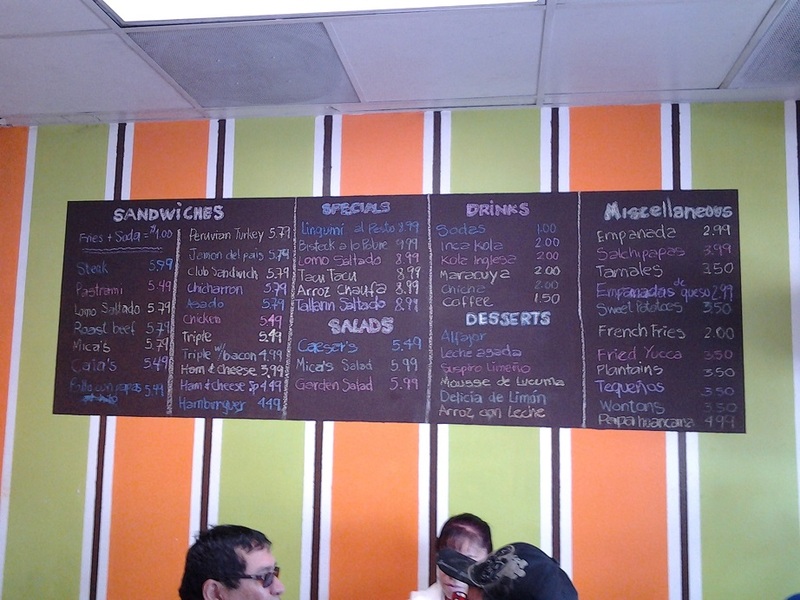 The menu board is on one wall, below. Click on the photo for a larger view. I returned another time for a late lunch. From 3 to 7 p.m. they were offering dinner plates, usually $9, with a soda for $7.07 with tax. 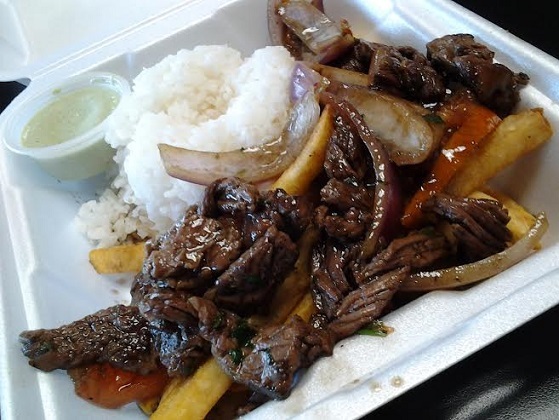 I had the lomo saltado (below): beef, onions and tomatoes over fries. Very good, and great for the price. It is, but the taste is mighty. You can’t sit comfortably for long, but you gain the satisfaction at having found excellent food in exceedingly humble surroundings. 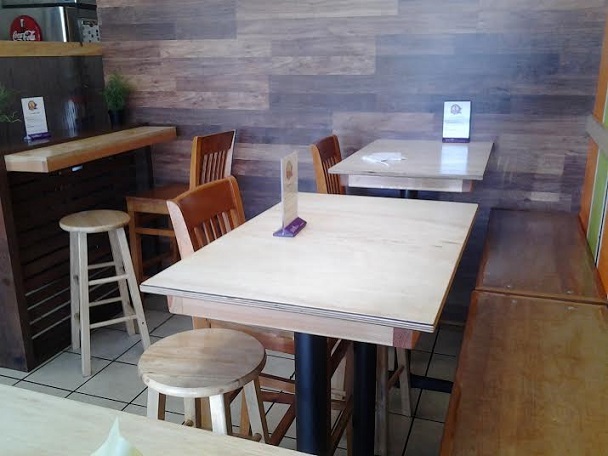 * Update July 2014: I returned for the first time in a couple of months to find a much-improved interior (below): tables and stools that now seat 18. The wraparound bar seating was removed. A much better use of the space, I think, and I hope the investment means the restaurant is catching on. I ate a lomo saltado sandwich with fries and drink ($7.62 with tax) and thought it was great. This entry was posted in Restaurants: Rancho Cucamonga and tagged Peruvian, Rancho Cucamonga, restaurants, sandwiches by David Allen. Bookmark the permalink. My wife and I both had “snow days” off of school this past Thursday thanks to the fire (so more like “fire days”), so we decided to make lunch plans. I recommended this place, based on your post, but because this restaurant is in Rancho Cucamonga, and both of our schools that had closed due to smokey skies are in Rancho, we decided we’d wait for another day. 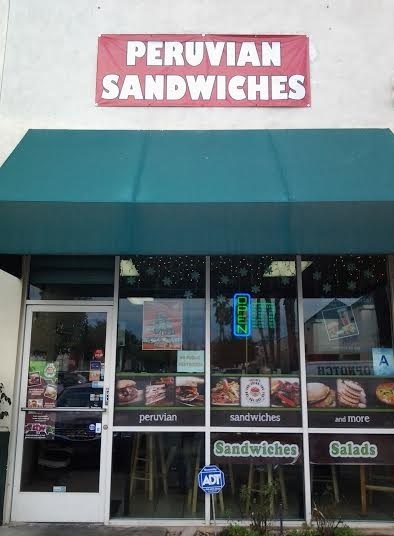 Instead we went to Lee’s Sandwiches here in Chino (featured in a Restaurant of the Week back in 2010! http://www.insidesocal.com/davidallen/2010/11/05/restaurant-of-the-week-lees-sa/) Yummy! So at this rate, you’ll make it to Mica’s in 2018? Just kidding. Thursday was not the best day to head into RC for lunch. I did it myself, but then, I laugh at danger.